Don't forget the UMass hoops slam dunk exhibition! OT, but basketball starts practice. UMass homecoming parade before the game. Mike Traini of "Fight Massachusetts" previews the UMass-Tulane game and says the Minutemen look to win their first Homecoming game since 2009. News OK picks Tulane over UMass 19-14. They also pick Buffalo over BC. Note that Buffalo lost to Albany in the opening week. Tulane is prepared for a road test at UMass. The New Orleans Advocate reports Tulane DE Ade Aruma is a athletic freak. Green Wave punter Zack Block is becoming a weapon for Tulane. A Tulane booster just gave $2.5 million to their athletic club. SB Nation says take UMass and the points. Watched Houston dismantle UConn last night 42-14. Your tax dollars at work: The National Institution of Health spends $50 thousand to discover if college students eat junk food when they drink. Matty Vautour reports Jalen Williams makes big plays while battling injuries. The UMass Daily Collegian says with a 63% completion ratio, Andrew Ford looks to lead the Minutemen for the foreseeable future. UMass' close loss to Mississippi State kept them out of ESPN's Bottom Ten. New Amherst restaurant Sunset Grill & Pizza will offer buy-one-slice, get one free if UMass beats Tulane Saturday. This article features RSSO DT Joe Previte 6-2 269. So far this year Previte has 4-2 GP-GS 2 UT 10 AT 12 TT 1.5-3 TFL and 1 fumble recovery (which was the one that ended FIU's chances). Tulane will feature a revamped offensive line against the Minutemen after starting center Junior Diaz suffered a season ending injury against Navy. John Leglue 6-7 298 will move to center and Kenneth Santa Marina 6-6 325 will move to Leglue's left tackle spot. Tulane HC Willie Fritz was pleased with the Green Wave's Wednesday practice. Tajae Sharpe was limited in Wednesday's Titan's practice due to a hamstring problem. UMass hoops will hold a fan event before Saturday's Homecoming football game. This looks like it'll be fun! Matty Vautour reports Andrew Ford is comfortable running the UMass offense. I would infer that Ford will be at QB again against Tulane. Tulane HC Willie Fritz names Glen Cuiellette as the Green Wave's starting QB against the Minutemen. Coach Fritz warns the Green Wave not to get complacent after an emotional win over Louisiana Lafayette. Adam Aucoin of the UMass Daily Collegian reports Andy Isabella has found his niche in the UMass offense. The Bangor Daily News reports UCF and UMass will be Maine's next FBS opponent. The Sports Chat place looks at UMass-Tulane and has the Green Wave by 2 points. Jeff Sagarin has Tulane 2 rating points ahead of UMass, but if you add three points for UMass being the home team (as per the heading), it's UMass by one. Victor Cruz is going to try to keep Odell Beckham cool. 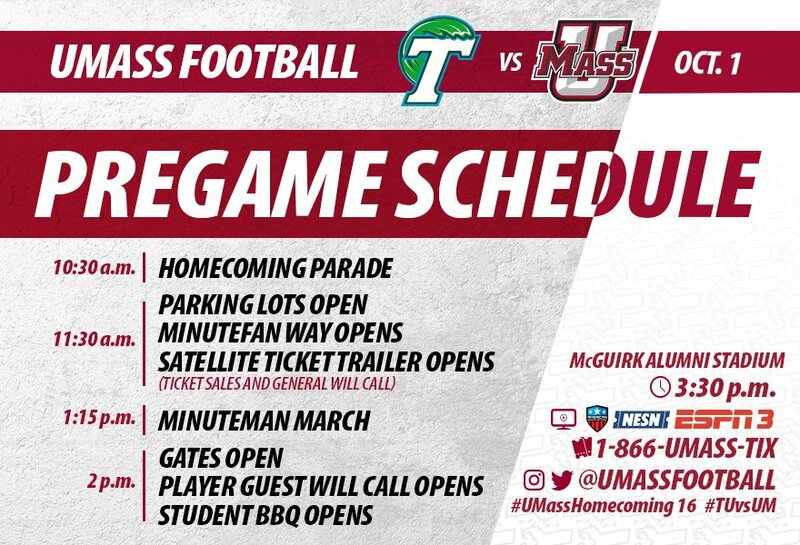 UMass has it's game notes for Tulane up. Tulane kicker Andrew DiRocco earned three weekly awards for his four field goal-three extra point performance against Louisiana Lafayette. Green Wave LB Nico Marley earned a Louisiana weekly sportswriter award for his 11 TT 5 UT 1.0 SACK, 3.0 TFL 1 FF effort against Louisiana Lafayette. Keepers College Football ratings has Tulane over the Minutemen by 12+ (.pdf download). He has the Green Wave ranked at #87, Minutemen #118 (another .pdf download). Former Green Wave football player Devon Walker looks to complete his education after suffering a devastating spinal cord injury in 2012. AT & T boosts mobile internet coverage at Tulane's stadium. Fox Sports has five candidates to replace Ron Turner at FIU. ESPN has the latest developments in the Big 12 expansion. Tajae Sharpe had only three receptions for 48 yards against the Raiders. Tulane's HC is Willie Fritz. He spent his last two years at Georgia Southern and went 9-3 in 2015 with the Eagles. Fritz brings the famous Georgia Southern spread offense to Tulane. At Georgia Southern in 2015, Fritz ran 1,370 times and passed 292 (82.4% rushing --per Phil Steele). This year the Green Wave has rushed the ball 139-953 4.8 AVE 63 LONG 9 TD's 238 yards/game. Passing 30-67-348 44.8% AVE 4 TD's 2 INT 102 yards/game. Whipple went 1-1 against the Georgia Southern in FCS. The Minutemen rushing defense has been stout this year, but the spread offense will control the time of possession and will be tough to shut down. The UMass offense needs to score some points like we did with Mississippi State. Tulane's defense has been only giving up 21 points a game and held Wake Forest to 7 points. We need to score to win. Florida International fired HC Ron Turner Sunday. Andrew Cyr of the UMass Daily Collegian reports despite improvement, UMass has yet to capture a marquee Win. A Louisiana Lafayette (which lost to Tulane Satruday) newspaper discusses the problems Tulane's spread option offense gives opposing teams. 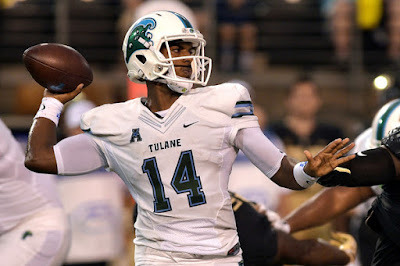 Green Wave QB Glen Cuiellette threw three TD's in Tulane's win over Louisiana Lafayette. The Tulane win over Louisiana Lafayette was a four-overtime thriller. Newsday features current Jets RB coach Marcel Shipp. His Jets bio. Tulane is #119 and UMass is #125 in total offense. OT, but I've been watching a lot of football and football commercials. Anyone besides me think the Burger King plastic faced avatar is kinda creepy? It has a Clockwork Orange vibe. Hey that was a good game. We were trading punches with an SEC team. They were better, but not by much. It was fun to watch and featured a couple of ESPN highlight reel catches by our receivers. The offense broke out with 411 total yards. WE made some mistakes and Mississippi State made some good ones. I still feel this team is light years ahead of the past in athletic ability and grit. Be sure to check out the post game quotes where Whipple said he enjoys coaching this team and he enjoyed coaching this game. We were right there with 'em all game. I truly believe the future is bright. UMass' writeup. Post game quotes. Mike Traini of Fight Massachusetts recaps the game. Dan Malone says the UMass comeback attempt came up short. Video of Coach Whipple's post game interview. Matty Vautour says UMass was unable to hold the lead. Matty says Andrew Ford played well enough to continue to start. The Jackson Clarion Ledger says Mississippi State avoided the upset. Maroon & White nation has five Bulldog players who played well against UMass. SB Nation highlights Jalen Williams outrageous catch. For Whom the Cowbell Tolls has five quick thoughts about the game. Florida lost by 10 at Tennessee. Boston College beat Wagner 42-10. Tulane beat Louisiana Lafayette in 4 overtimes. Old Dominion beat UTSA 33-19. Louisiana Tech lost to Middle Tennesse State 38-34. South Carolina lost to Kentucky in a defensive struggle. Troy blew out New Mexico State. BYU lost to West Virginia. Another Saturday, another SEC team. Another real challenge to a still building UMass squad. Unlike Michigan or Wisconsin in our first couple of years, I think the Minutemen will be competitive again today. It'll be a good day to work on our run game and get Ford more reps. I was really impressed with the UMass defensive secondary last week with their nine pass BkUp's. The Bulldog's offense has not been very productive so far this year. Mississippi State is #109 in total offense. If the UMass defense can keep the game reasonable into the fourth quarter. We could have a chance. Or we could get run over by a big, physical SEC team. After today, six of the eight remaining games are against Group-of-five opponents. In addition, the 2016 Minutemen recruiting class continues to shine. In the weekly Gridiron Club e-mail Coach Whipple said:" What is really exciting is that we had 13 freshmen play a combined 330 plays which is really promising for the direction of our program. " That does not include JUCO's Andrew Ford, Ali Ali-Musa, Tedrick Lowery, Colbert Calhoun and more. I'll be at Gillette. Hope to see everyone there. Go UMass!!! Matty Vautour says UMass seeks a Power Five victory. Mike Traini of "Fight Massachusetts" previews today's game. NESN says UMass-Mississippi State highlights their Saturday schedule. BTW, here in Southern NH, the game will be on Dish Network's channel 440 ALT. The Boston Herald reports the Minutemen look to shock Mississippi State. Fox Sports reports Mississippi State looks to put together a total game at UMass. Team Speed Kills predicts Bulldogs 34 Minutemen 13.
dJournal.com says Power Five opponents are nothing new for UMass. Maroon & White Nation says the keys to victory for the the Bulldogs is to manhandle UMass. The Hattiesburg American says it's no time like the present for Mississippi State to start winning. The Columbus Dispatch has five things to watch for in the Mississippi State-UMass game. First year Mississippi State DL coach Brian Baker considers the state of the Bulldogs defensive line. Matty Vautour has a post on college football and says North Dakota State is an FCS team to be avoided. Nick Traini has a list of recruits that attended the UMass-FIU game. Gobbler Country says take UMass and the points. The American Sports Network has a post on the Andrew Ford to Adam Breneman connection. 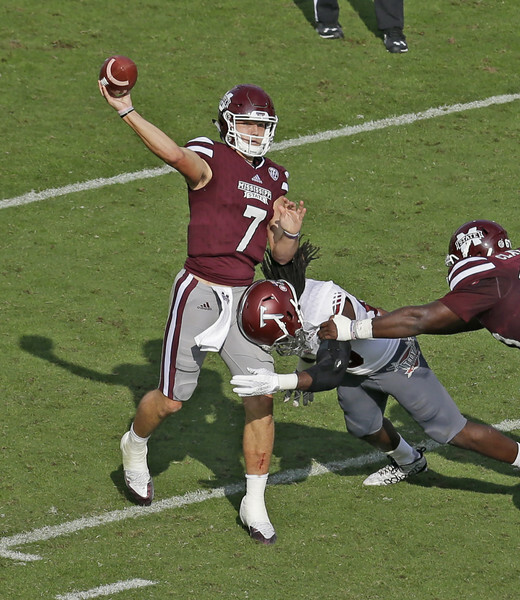 Bulldogs 247 says Mississippi State QB Nick Fitzgerald looks to bounce back against UMass. SEC Country reports Fitzgerald looks to have a big day against the Minutemen. A Clarion Register writer picks Mississippi State 35-UMass 14. Vanderbilt Hustler says the Bulldogs have five winnable games coming up starting with UMass this Saturday. Maroon & White nation reports on the Bulldogs fall-off in rushing production over the last two years. #19 Florida meets Tennessee. Gator QB Luke Del Rio is out with an injury. Tulane plays at home vs Louisiana Lafayette. Old Dominion plays 1-2 UTSA. Louisiana Tech meets Middle Tennessee State. BYU flies East to meet West Virginia. Today's the autumn equinox at 14.21 UT. It's autumn in New England. My favorite time of year. Mississippi State features a power running attack. In three games the Bulldogs have nearly doubled opponents rushing yards 585 to 305. Mississippi State has averaged 5.3 yards a carry. That's against two SEC opponents (LSU and South Carolina). Their leading gainer is huge QB Nick Fitzgerald (6-5 230) He totaled 32-240 6.8 AVE 74 LONG 73.0 yards/game. RB Ashton Shumpet (6-2 218) is fourth with 14-76 5.9 AVE 11 LONG 25.3 yards/game. Saturday should be a busy day for the Minutemen linebackers. They'll have to contend with the Bulldog running backs and keep contain on Fitzgerald who should be a load to tackle since he's bigger than any of the UMass LB's. Matty Vautour has a podcast about the win over FIU and speaks with a Tennessee Titans writer about Tajae Sharpe's success in the NFL. Adam Aucoin of the UMass Daily Collegian reports UMass is looking for an upset against Mississippi State. Mike Train of "Fight Massachusetts" has five questions for Paul Jones of Bulldogs 247. FIU coach knows "FIU should have beaten UMass". Mississippi State coach Dan Mullen is pleased with the way the UMass schedule turned out. The Bulldogs defense is using different personnel to improve their third down performance. Maroon & White nation power ranks the SEC going into Week #4. BC coach Steve Addazio says UMass was "pretty athletic". Matty Vautour has a post on Mississippi State's Dan Mullen, who's a New Hampshire native. Mullen's Mississippi State bio. Matty also reports that Ross Comis is still limited by an injury. Whipple said he like John Robinson-Woodget as a late-game clock killer. I'd use him for more than that. He'd be my choice for a third down and anything inside the five yard marker. The UMass Daily Collegian says Comis and Ford are still neck-and-neck for starting QB. Bulldog fans will be able to watch the UMass-Mississippi State game on local TV. Mississippi State has a QB controversy of their own. Bulldog QB Nick Fitzgerald is 6-5 230. He's an SEC-sized quarterback. A CBS writer has UMass out of his "bottom 25" list. Florida is trying to poach Mississippi State's A.D. Fan Sided wants Mississippi State to run the ball more on third down. Victor Cruz set the Giants up for a game-winning field goal last Sunday. The NY Post says Cruz went up and came down with a legendary comeback. UMass has its game notes for the Mississippi State game up. Bulldogs HC Dan Mullen previews the Mississippi State-UMass game. 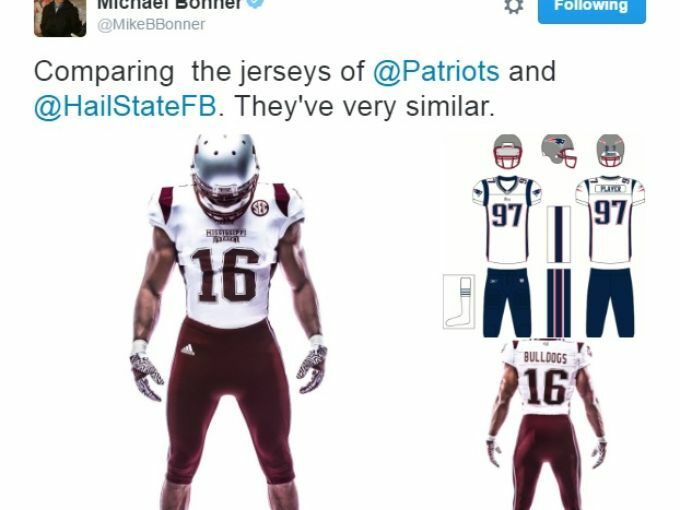 The Bulldogs will wear Patriots-themed unis for their visit to Gillette. Matty Vautour reports Coach Whipple didn't shed much light on the QB situation during Monday's phone interview. Keepers college football rankings has UMass #110 and Mississippi State at #80 (.pdf download). He has the Bulldogs as a 19+ point favorite. History of Mississippi State traditions. Bulldog fans have special dispensation from the SEC to use cowbells during league games. The Clarion-Ledger says Bulldog DB Cedric Jiles and DL Wil Coleman may be available for the UMass game. Andrew Cyr of the Daily Collegian reports on the QB situation and relates Coach Whipple said "Mississippi State is a different animal than FIU". Maroon & White Nation relates how UMass and Mississippi State ended up playing after both sides needed to fill their 2016 schedule. Conference USA took it on the chin last Saturday with FIU and four other C-USA teams losing to Group-of-Five games. East Carolina's Zay Jones had a mind-boggling 22 receptions against South Carolina last Saturday. Mike Traini of "Fight Massachusetts" recaps Saturday's game against FIU. As he says, it wasn't artistic, but we've beaten the one Group-of-Five team we've met. That's a start. Matty Vautour has a post about Andrew Ford and Adam Breneman were back on the field together at McGuirk on Saturday. He also reports Victor Cruz and Tajae Sharpe helped their teams to victory in NFL Week #2. Las Vegas has Mississippi State by 23 over the Minutemen. Mississippi State saturates the Cleveland area with billboards touting former Bulldog players. The 2017 schedule for Mississippi State is out. We play 'em the week before the Bulldogs play Alabama. Maybe UMass can catch them looking ahead. For whom the cowbell tolls, says the Bulldogs need a fired up Dan Mullen. Good all-around game by UMass. We needed a win and we got one. I think the Minutemen found some stuff out. 1. Andrew Ford looked like the QB I saw at practice. Despite only having two days of practice, Ford looked impressive. He engineered 394 yards of offense. Ford connected with nine different receivers. He had excellent pocket awareness as he slipped the pass rush a number of time. When he did run, he ran with his head up and completed a number of passes outside the pocket. And for 55 of the 60 minutes, he did all this without a running game. Ford converted A LOT of third and longs. 2. Speaking of the running game, I don't know about you, but John Robinson-Woodget would be my official third, fourth and anything-inside-the-five running back. At 6-1 247, Woodget displayed quickness and down-hill running. 3. The defense was again outstanding. The defense has given up 21.0/ points a game with a schedule that has included two Power Five teams. The defense had 5 TFL, 2 SACKS, 3 FF and NINE BrUP's. The defensive secondary, led by Isaiah Rogers had the coverage and when thrown at, didn't allow the receiver to catch the ball. This was a big improvement from BC, where we had the coverage, but didn't make a play. Enjoy the week, UMass fans. I'm going to. The UMass write-up. Be sure to read the post-game quotes .pdf for some world-class sour grapes from the Panthers coach. Dan Malone covers the win. Whipple was non-committal about the UMass quarterback situation. The post-game video is worth watching. Whipple said the quarterback situation is the "best since I was with the Steelers". Dan Malone and Andrew Cry break down the win. Matty Vautour report UMass held on to win. Matty has notes from the win. The Boston Herald report UMass gets their first win. The Miami Herald says FIU falls to previously winless UMass. How about winless FIU plays UMass and stays winless? The Herald reports gaudy stats for the Panthers' RB was no consolation. The UMass Daily Collegian reports the Minutemen got the running game going late. The Gators may have lost QB Luke Del Rio in a 34-0 win over North Texas. Mississippi State threw a scare into LSU. Tulane also threw a scare into Navy. North Carolina rolled over Old Dominion. Louisiana Tech and Texas Tech combined for 104 points. South Carolina edged East Carolina. Neal Brown's Troy Trojans scored a big upset win over Southern Mississippi. And saving the best for last, Virginia Tech eviscerated Boston College 49-0. Well today UMass finally plays a Group-of-five team. The weather is predicted to be beautiful at McGuirk. It'll be a great day to get a win. The defense has certainly played well so far. The Panthers, in the game I watched showed some speed and ability to move the ball. They also showed they make some mistakes. Continued intensity by the defense and getting some turnovers would help today. The offense needs to get in gear. We need to be able to run the ball. Comis has to make decisions quickly. UMass needs some production from WR's not named Andy Isabella. Let's put it together and get a win. Matty Vautour reports UMass will try to break through vs the Panthers. The game will be available on NESN. Jacksonville.com has a short preview of today's game. FIU's A.D. Pete Garcia will be leaving in 2018. BC plays Virginia Tech. The Eagles are going for their tenth straight conference loss. Mississippi State plays LSU at Tiger Stadium. Tulane plays Navy in a battle of two option teams. Old Dominion plays North Carolina State. Louisiana Tech plays Texas Tech in a battle of two high-scoring offenses. South Carolina meets East Carolina. BYU plays UCLA at home. Hawaii plays Arizona at home. The UMass website has gameday FIU informantion up. Mike Traini of "Fight Massachusetts" previews tomorrow's game against FIU. Matty Vautour has a post on today's Florida-Louisville game. Memo to A.D. Bamford: one team not to match us up with is Louisville. I watched them play Charlotte last week and it was 56-0 at the half. Up 49-0 with two minutes to play in the half, the Cardinals went into their two-minute drill to score again..
FIU Football interviews Matty Vautour on Saturday's game. An FIU writer previews the Panthers-Minutemen game. The Daily Herald power ranks BYU's opponents after the second week of the season and has UMass at #12, behind FCS SUU. USA Today looks at 0-2 teams that have a chance to get their first victory tomorrow. Two MAC teams lost to FCS teams last week. Miami lost to Eastern Illinois. The shocker was Kent State lost to North Carolina A&T, which is a bottom-of-the-barrel FCS squad. When Miami plays at Appalachian State this Saturday, it is the result of a long chain of events in which, UMass was deeply involved. 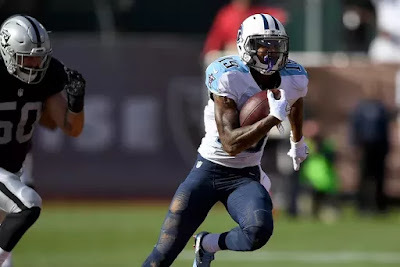 The Tennessean asks if Tajae Sharpe is a burgeoning star. CBS Local New York says overcoming long odds is what Victor Cruz does. Newsday report with the first salsa out of the way, Cruz can work on steady improvement. The FIU website has a video interview with Panther HC Ron Turner about the Maryland game and this week's contest with UMass. Dan Malone says 0-2 UMass can't afford to overlook FIU. Dan also report Marquis Young hopes the holes open up against the Panthers. After getting overpowered last week with BC, I hope the offensive line is highly motivated to show they are better than that this week against FIU. Matty Vautour has a podcast with former UMass star Brandon London. London's wikipedia page. London's Twitter feed. The UMass Daily Collegian reports UMass is looking for it's first victory of 2016. The Collegian says Saturday's game against FIU will reveal a lot. Team Speed Kills talks about how UMass got pressure on 16 of Luke Del Rio's 47 dropbacks. Mike Traini reports UMass had a lot recruiting visitors for the BC game. FIU Sports fans are getting restless with Panther sports director Pete Garcia. Oklahoma President says Big 12 expansion is not a sure thing. ESPN thinks the NFL won't fine Victor Cruz for his 9/11 cleats. Tajae Sharpe was graded as one of the top rookies of Week #1 in the NFL. I called the UMass ticket office and they e-mailed me my McGuirk parking passes. No problem. I get a yellow lot parking pass because I have season tickets, but in the case of McGuirk my group is split into two cars, so I needed another pass. A.D. Bamford says no one will be turned away, so this year will be a good time to get the new parking system in place. To my mind, it hints that there are some plans in the works for McGuirk. FIU has their game notes for UMass up. They also have a first look at FIU vs UMass. Dan Malone reports UMass QB Ross Comis was still limited by physical problems. Whipple still expects him to start Saturday. Malone also says backup QB James Sosinski has left the program. Sosinski was in a walking boot during the August practice I attended. Matty Vautour also has a post on Comis. The Miami Herald reports FIU QB Alex McGough is "probable" for UMass. The UMass Daily Collegian says the Minutemen look to get the running game going against FIU. UMass is dead last in FBS rushing offense. We're also dead last in total offense. In defense UMass is #63 in total defense (tied with LSU) and #68 in scoring defense. FIU is #107 in scoring defense and #109 in total defense. Logan Laurant leads the nation with 835 punting yards; he's #22 in yards/punt with 43.9. Vegas Insiders has UMass-FIU as "pick 'em". UMass has their game notes for Florida International up. FIU does not as of 6:30 AM today. UMass has a new parking policy for ALL the lots adjacent to McGuirk. You need a parking pass even if you are not in Yellow Lot. Mike Traini of "Fight Massachusetts" has some more on the parking policy. Matty Vautour says the Minutemen's offense needs to get in gear. 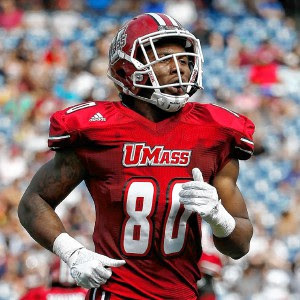 Mike Traini reports that UMass DB Jesse Monteiro was arrested for disorderly conduct at a party Sunday night. The UMass Daily Collegian wraps up the Minutemen's loss to BC. The Sports Chat Place looks at the FIU-UMass game. There are no odds yet for the game as Panthers QB Alex McGough was injured. Maroon & White Nation report Mississippi State fans can watch the Minutemen-Bulldogs game on ESPN 3. Victor Cruz played 50 snaps against Dallas. The NY Post says Cruz's TD catch caused a salsa dance party among the Giants. Cruz was wearing patriotic cleats to honor the memory of 9/11. UMass has a gallery from the Boston College game. Dan Malone says Ross Comis is UMass' quarterback. Dan also reports Marquis Young has been contained so far this year. The Berkshire Eagle says sacks and turnovers doomed UMass against Boston College. Keeper's College football ratings has UMass at #114 (.pdf download). 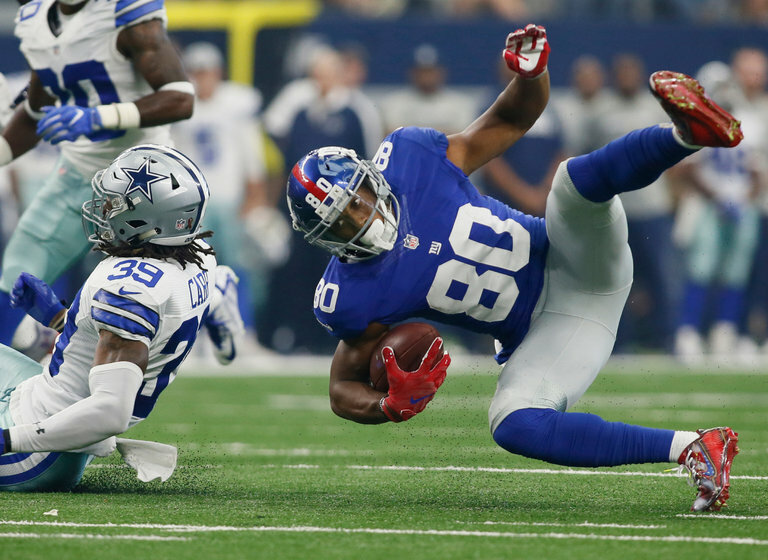 Victor Cruz had four receptions and a TD against Dallas. NJ.com says Cruz had a triumphant return to football. Tajae Sharpe led the Titans with seven receptions for 76 yards Sunday. Matty Vautour says Sharpe and Cruz had productive weekends. Well if it was a fight between the UMass offense and BC's defense, they would have stopped it. The Eagles were much more physical and overwhelmed the Minutemen offense all day. Ross Comis took an early borderline legal clothesline hit and was never the same. Comis went 11-28 for 145 yards, had 1 INT and fumbled twice. UMass could not protect Comis and could not run the ball. When we did get a break, such as the interception by Shane Huber we went nowhere. Shakur Nesmith could not catch a nice pass late in the second half that would have flipped the field. The defense made another strong effort. The Minutemen force nine punts by the Eagles, intercepted Towles once and held BC's running back Jon Hilliman to 54 yards (a 2.5 AVE). The UMass defense had 8 TFL. The majority of BC's rushing came when Towles was flushed out of the pocket. Logan Laurant had another outstanding day as he helped the defense with a UMass record 547 punting yards and averaged 45.6 yards/punt. He also dropped four punts inside the BC twenty. UMass needs to find some offense or it's going to be a long year. Some of the problem is the caliber of the opposition, but we need to improve bigtime. Mike Traini of "Fight Massachusetts" recaps the BC game. The UMass website says the Minutemen were stymied. Dan Malone says the offense struggled. Mark Whipple breaks down Ross Comis' struggles. Shane Huber said two defensive breakdowns contributed to BC's total. Matty Vautour reports turnovers and the BC defense were too much for the Minutemen. The Boston Herald reports BC bounced back and UMass faded. The UMass Daily Collegian said the Minutemen fell flat. Florida pounded Kentucky 45-7. The Gators had 546 yards of offense. Mississippi State stopped a seven game South Carolina win streak against the Bulldogs. Tulane routed FCS Southern 66-21. Appalachian State cruised to an easy win 31-7 over Old Dominion. Louisiana Tech blew out FCS South Carolina State 53-24. Wagner rolled over NAIA Concordia 38-0. Troy played Clemson tough and lost 30-24. BYU lost to Utah 20-19 in a game where two Cougar defenders were ejected for targeting. After traveling 19,000 miles in their first two game, Hawaii beat UT Martin 41-36. 2016 is my 40th year with UMass season tickets. There's been a lot of water over the dam in that time. There's has been high points and low. With three years of .500 ball at the end of FCS and losing since the begin of FBS, there's has not been much to encourage UMass fans. We came close last year to beating Temple, which was a Top-25 team at the time. That would have been huge for the program. Today we face another Power Five team. Realistically, BC should have an edge. It would be great for morale if we could win. The Minutemen played mistake-free ball at Florida. Let's play with energy and see what happens. Matty Vautour says BC will be a challenge. Amherst native Taj-Amir Torres is looking forward to playing UMass. BC Interruption has some final thoughts. One BC Interruption writer thinks UMass will cover the points. The Patriot Ledger reports BC and UMass are set to lock horns. The Quad City Times says Boston College hopes to turn it around against UMass. The Boston Herald reports the Eagles won't be caught napping against the Minutemen. The Herald also relates UMass and BC are battling on the recruiting trail. News OK says Boston College Steve Addazio could be on the hot seat. Maryland rolled over next week's foe FIU 41-14. The Terps knocked FIU starting QB Alex McGough out of the game early. His replacement RS Freshman Maurice Alexander went 9-18 131 yards 1 TD LONG 32. Alexander showed some flashes as a dual-threat QB. He ran 9 times for 41 yards. The Panthers can make some big plays. The UMass defense will need to play well in order to beat them. Matty Vautour has a podcast about the Boston College game with guest Jon Meterparel. Matty says a win by the Minutemen would go a long way. Ryan Bamford is hoping for 30,000 in attendance. Dan Malone says UMass needs a win to make it a real rivalry. Ross Comis hopes to improve in his second game as a starter. Howard Herman of Berkshire Eagle reports UMass and BC are ready to play the game. For Fred Semerlas BC's 1978 loss to UMass still matters. The UMass-BC-UConn rivalry is still there and it still matters. No one remembers the result of the Boston College-North Carolina game two years ago. The three teams should play each other regularly. It'll help build interest in the three schools and help attendance. UMass needs to get competitive to make this work. I hope that starts tomorrow. Athlon Sports previews tomorrow's game and predicts Eagles 14 Minutemen 10. "Our OL and DL is such a huge advantage that it almost doesn't even matter what the skill players do." BC Interruption interviews UMass beat writer Matty Vautour. NESN reports BC is a 17-point favorite over UMass. SB Nation says take UMass and give the points. Cougar Blue power ranks BYU's opponents. UMass fans should be home in time to view Mississippi State-South Carolina at 7:00 PM on ESPN2. The Bulldogs have lost seven straight to South Carolina and need a win after being upset by South Alabama last week. Tulane meets FCS Southern University Saturday. Old Dominion plays Appalachian State, who nearly took down Tennessee last week. Louisiana Tech plays FCS South Carolina State. Neal Brown and Troy University are up against a different class of opposition as they get Clemson away. BYU faces Utah in the Battle of the Bee Hive State. Boston College's trip to Ireland is nothing compared to the 19,000 miles Hawaii flew in the Warriors first two games. Hawaii plays UT Martin at home this week. ESPN says a veteran approach has Tajae Sharpe poised for success. Nice video about the Gators game from the UMass athletic dept. Additional buses have been added for UMass students wanting to attend the BC game. Good work students! It's been a long time since I watched the Minutemen beat Boston College. May you not have to wait a comparable time. Mike Traini reports 20 bus loads of students will be traveling to the game. True freshman OL Raquan Thomas is the feature of this post by Matty Vautour. Great start to Thomas' career. He's got an NFL body. The sky is the limit if he works hard. Everyone was saying he'd be gassed after one quarter at the Swamp, but he played most of the game. Hope he gets to squash some Eagles this week. The UMass Daily Collegian has UMass preparing for the Battle of the Bay State. Andrew Cyr says UMass needs to provide a reason for fans to invest with the team. The Collegian reports UMass' defense is ready to tackle Boston College. The BC student newspaper says the Eagles can capitalize on UMass' struggles. "If BC can replicate its effort from Week One, it should have no issues dominating UMass’s offensive line and getting to Young." The Enterprise News features UMass safety Jesse Monteiro. His UMass bio. Boston College's defensive end Harold Landry, who has been limited by a leg injury, should be good to go against UMass. UMass LB Shane Huber and BC RB Jon Hilliman played on the same team at St Peters Prep in NJ. FIU, UMass opponent after Boston College, plays at Maryland this week. Campus Insiders previews the Terps-Panthers game. Mike Traini of "Fight Massachusetts" recaps the Florida game. UMass did knock the Gators out of the Top 25. Dan Malone has UMass a two touchdown+ underdog to BC in the Battle of the Bay State. BC Interruption has BC vs UMass depth chart. Matty Vautour reports UMass players weren't satisfied with just keeping it close against the Gators. Matty says WR Jalen Williams is not practicing, but could play anyway against the Eagles. Right now the WR corps looks somewhat concerning. Except for Andy Isabella, nobody looked like a go to guy for Comis. TE Adam Breneman looked a little rusty in his first game back from two years off. Hopefully, he will be more involved in the offense this week. Some quick passes to the TE will help Ross Comis deal with BC pass rush. Ryan McGee of ESPN has UMass in the "Bottom Ten" in his column. Not a great journalistic effort. He has Buffalo and Albany previously playing in DII rather than FCS. Keepers College Football rankings has UMass at #120 after week #1 (.pdf download). Note that Keeper is a computer guy and computer algorithms tend to be inaccurate for the first month or so because they're working on last years stats for the first couple of games. Computer rankings are the most accurate at the end of the season, when you don't need 'em. Massey Computer rankings has UMass at #116, one notch below FIU at #115. The Boston Herald says the Eagles must finish better against UMass. September 17th foe Florida International found a deep threat in WR Stantley Thomas. His FIU bio here. The Panthers list three co-starters at RB. Fox News has "Who in the world is Tajae Sharpe." Fantasy Football Today reports Marcus Mariotta says Tajae Sharpe makes it easy. Vladimir Ducasse worked out for the NY Giants Tuesday.